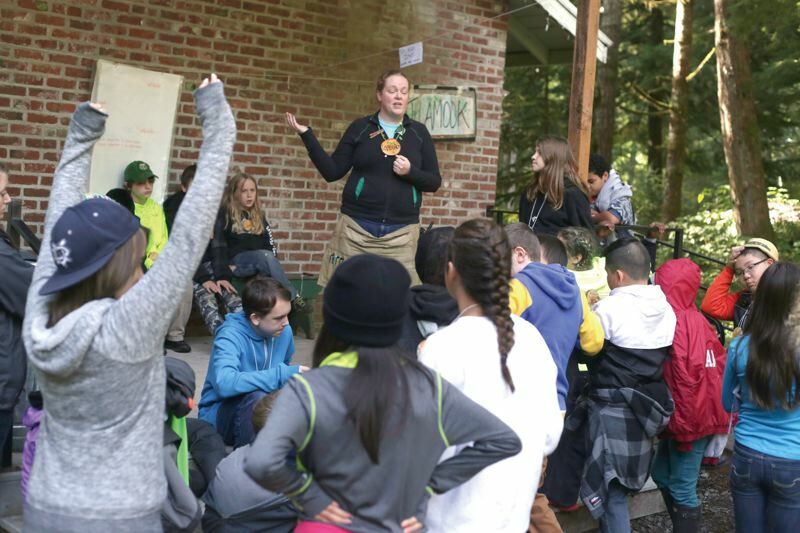 Outdoor School has been a rite of passage for sixth graders in the Portland metro area since the mid-1960s. Recently, we spent a week at Camp Namanu outside Sandy with a group of students. We interview founder Warren “Gil” Gilfillan, and see film of students, educators and Mr. Gilfilan from the first Outdoor School in 1966. Photo Credit: PAMPLIN MEDIA GROUP: JONATHAN HOUSE - Camp Howard Outdoor School supervisor Andrea 'Coho' Hussey shows visitors Martin Kuns and Wally Cole whats changed and whats stayed the same from earlier times. To the roomful of sixth-graders, Mr. Gil was just another grown-up, a guest at the table who got the extra chocolate chip cookie at the end of the meal. As they finished their meal of taco stew, the 92-year-old stood to introduce himself. “I’m Mr. Gil, and I was the first director of Outdoor School, back in 1966,” he said with his hand raised, his voice booming. The children whooped and hollered. Warren Gilfillan, known to everyone for the past 48 years simply as “Mr. 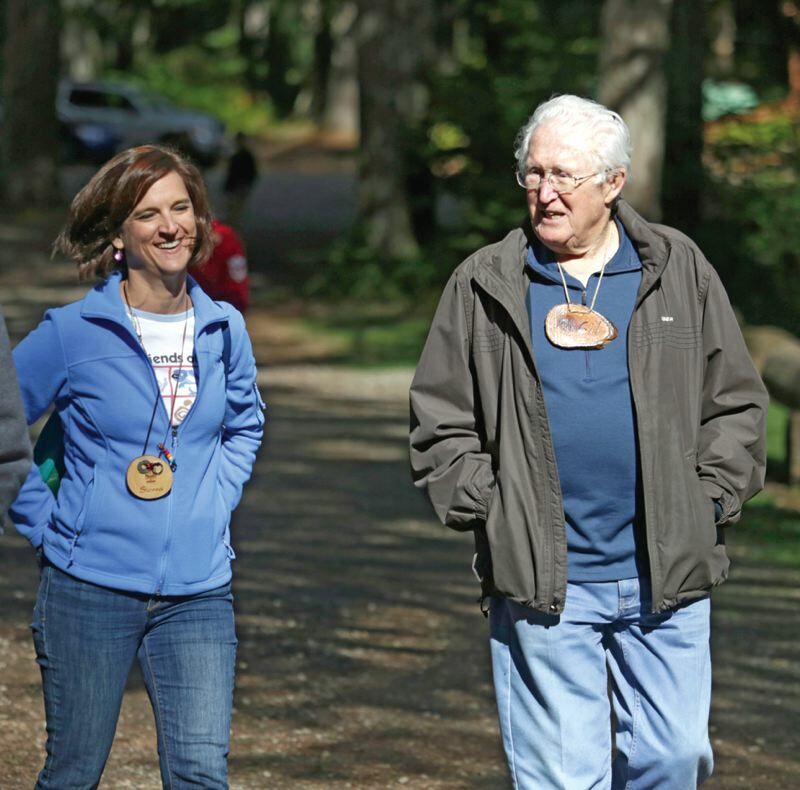 Gil,” is a living legend, the founding father of outdoor education in Oregon. “Thank you,” he said to the hundreds of students and adult leaders at Camp Howard one clear morning last month. Spry as a 40-year-old, the nonagenarian made a rare visit to the Outdoor School site between Corbett and Sandy, east of Portland, to visit with campers and reunite with a handful of other Outdoor School pioneers. 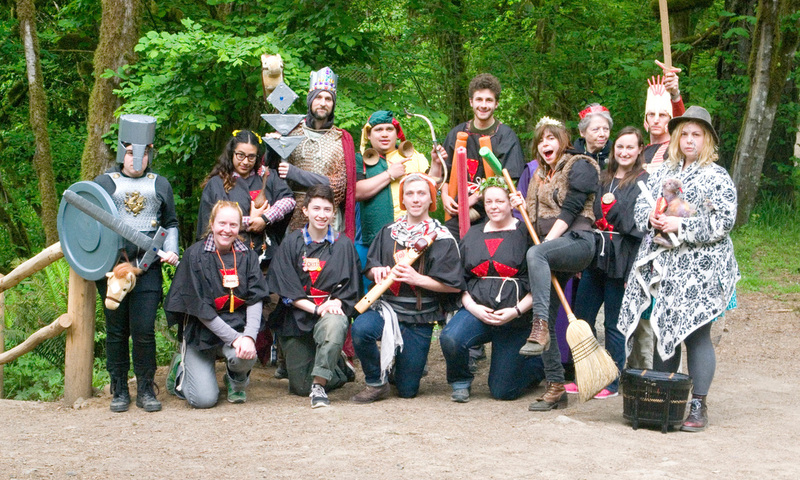 As per tradition, they all called one another by their Outdoor School names, which people choose for themselves and proudly wear on a “wood cookie” necklace while at camp. Mr. Gil met with Wally “Wapiti” Cole, Marty “Spike” Kuns, Jim “Duster” Gorter, and Bob “Name Tag” Mann, all retired Outdoor School administrators from around the region during past decades. They chuckled at stories from the good old days, and marveled at how most things at camp appeared unchanged from their time. The food is basically the same, but “back then we didn’t have drink options,” Mann noticed. There was no pitcher of water on each table. They just drank milk. Photo Credit: PAMPLIN MEDIA GROUP: JONATHAN HOUSE - Kim Silva, executive director of Friends of Outdoor School, walks the grounds of Camp Howard with Outdoor School founder Warren Gilfillan, better known as Mr. Gil. Three generations of Oregonians have now experienced the rite of passage that is Outdoor School, created as a weeklong environmental learning experience in the field. For many Oregon youth, it has been a formative experience, the first time they get up close with nature. Yet more than half of the students who participate nowadays do so for a condensed version of three days, rather than a full week, because of their school districts’ unstable funding. It’s primarily the private schools — such as Holy Cross and Portland Jewish Academy — and small districts like Riverdale that send their students for a full week. Those schools, or their parents, can afford to buy a full week for their youth. Portland Public Schools and other districts have had a rocky time trying to piece together funding since 2011. Centennial School District had to bow out altogether. Funding has stabilized in the past two years, but Prince says he’s always seen this period as a bridge to the long-term big picture, wherein supporters find a way to sustain the Outdoor School’s legacy for generations to come. Advocates, including Mr. Gil, have been lamenting this reality for years, and kicked off a new statewide effort this fall to allow every middle schooler in Oregon to attend Outdoor School for a full week. ​That would about double the number of students participating, from the 26,000 Portland-area students currently attending. The movement is called Outdoor School For All, organized by a group of advocates called the Oregon Outdoor Education Coalition, a partnership between Friends of Outdoor School, the Gray Family Foundation, Metropolitan Group, and other parents, educators and supporters. A bill sponsored by then-Rep. Jules Bailey, D-Portland, died in the Oregon Legislature two years ago, but now organizers hope there’ll be a much broader grassroots effort to change the political discussion, Burkholder says. Another bill is being readied to go before lawmakers in the 2015 legislative session. 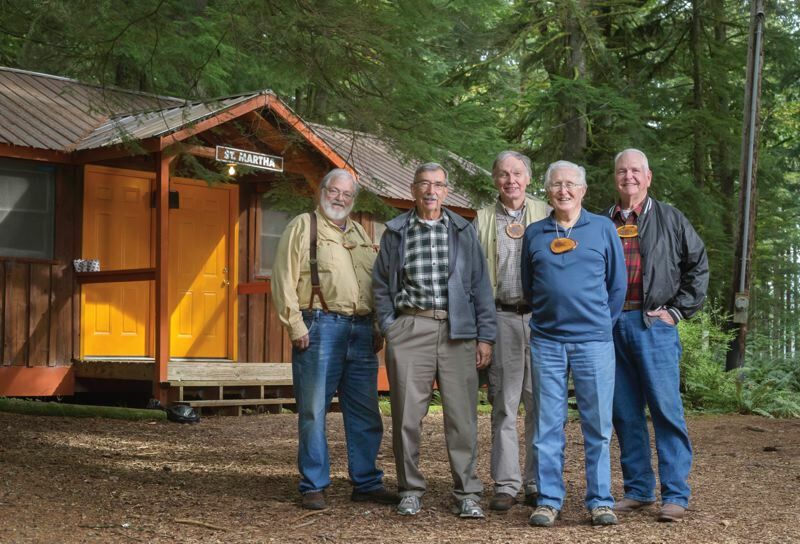 Photo Credit: PAMPLIN MEDIA GROUP: JONATHAN HOUSE - Mr. Gil, second from right, stands with fellow Outdoor School pioneers Bob Name Tag Mann (left), Jim Duster Gorter, Wally Wapiti Cole, and Martin Spike Kuns. 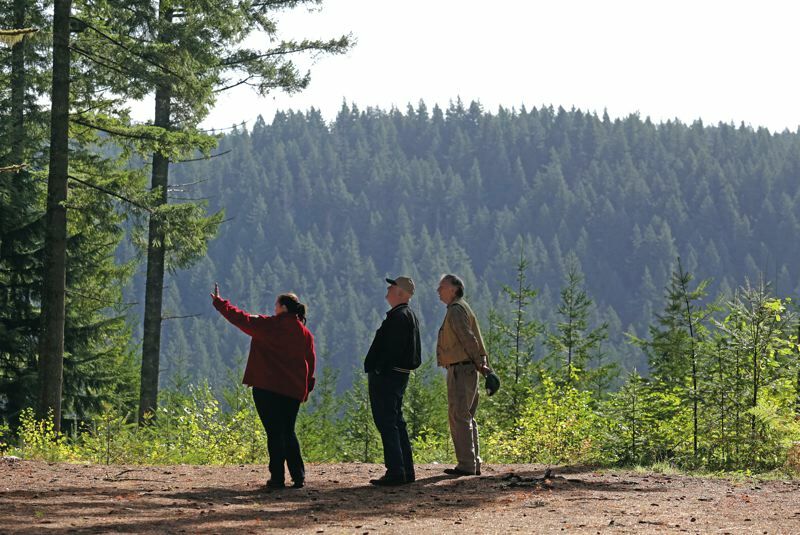 “We believe there’s a lot more interest statewide” than a few years ago, says Kim Silva, executive director of Friends of Outdoor School, which works to support students in Multnomah, Washington and Clackamas counties. The cost of sending all sixth-graders in the Portland area to Outdoor School for one week, she says, is about $6 million. Silva says the Friends group has an aggressive long-term goal of raising $1 million per year through philanthropy, which would cover one day. Metro funds could cover a second day, she says. Silva’s hoping to fill in the gap for the other four days. While the Friends group hits up its donor base and the coalition lobbies the Legislature, advocates are gearing up for 2016, Outdoor School’s 50th anniversary. Mr. Gil grew up in Seattle, earning a degree in wildlife management, then working for the Oregon Fishery Commission. He next served as director of camping for the Boy Scouts of America, which inspired many of Outdoor School’s traditions — everything from the wood cookies and family-style meals to the repeat-after-me cheers and silly skits that build routine and camaraderie for Outdoor School campers. Ironically, Mr. Gil never got to send his son to Outdoor School in its first year, 1966, despite the fact that he was in sixth grade. “It would’ve been nepotism,” Mr. Gil says, so he chose other schools to participate. Five-hundred students from Multnomah, Clackamas, Washington and Columbia counties participated in that first spring session. His daughter did get to go, eight years later. ​Mr. Gil’s son now owns a pyrotechnics business and his daughter, Jule Gilfillan, is an Oregon Field Guide producer for Oregon Public Broadcasting. Photo Credit: PAMPLIN MEDIA GROUP: JONATHAN HOUSE - Outdoor School students get ready to go to their next activity. Mr. Gil traveled with them both until last year, to places such as Nepal, Tibet, China and Europe, but says he’s “too old” for that now. He has a couple of grandkids and a great grandchild and lives in Wilsonville half the year while wintering in the Southern California desert. The secret to a healthy, long life? Living in the outdoors, he says. There have been many efforts to raise funds for Outdoor School over the years. Rachel “Radish” Byron-Law, a science teacher who was inspired by her Outdoor School experience as a camper, volunteer and staff leader, has taken one of the more creative approaches. The 30-year-old Portland singer and her band, Arbielle, wrote a song about Outdoor School called “Sandy River.” Band members hope downloads of the song will raise money to restore Outdoor School to a full week for students in Multnomah County. Byron-Law says she wrote the song out of her intense feelings for the program, as an alumna and past leader. “It was heartbreaking to watch ODS crumble from a thriving, historically rich, full-week program to a three-day field trip,” she says. A friend who lives in the Bay Area offered to record the song in his studio for free. Arbielle signed with Electronic-Boy Productions last winter and their album, “Roots Grow Deep,” is out in iTunes, Amazon and elsewhere. celebration for current and former staff and their families, held on March 5th, 2016 at the Angelos Outdoor School site. 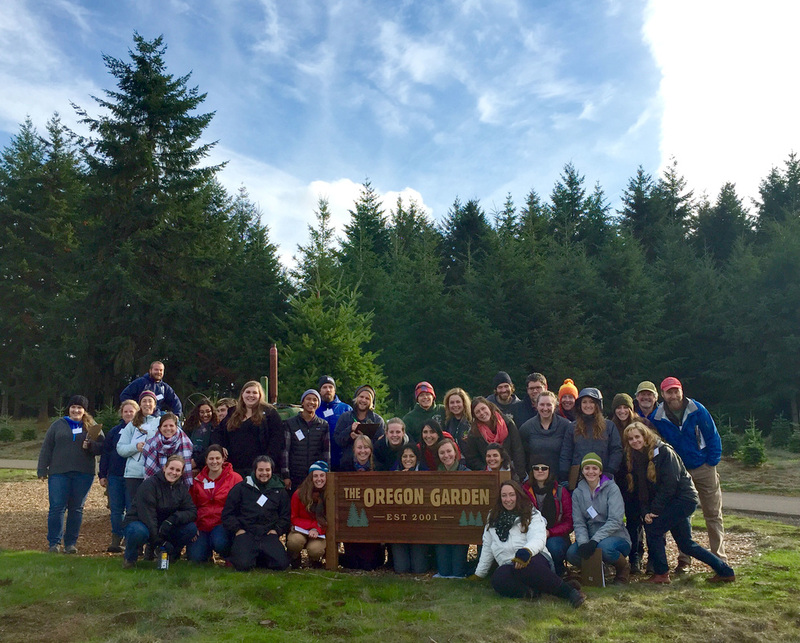 "Among many changes, the most important one I have experienced at Outdoor School has been my approach toward people. At camp, I have been able to see my snap judgments fall egregiously short. There were numerous times where I worried a sixth grader was too high-energy or too closed-off to work with, only to observe them channel their excitement or open up with keen observations. At Arrah Wanna, I met sixth-graders, staff, and student leaders that I might have written off with an errant judgment in other environments." "Maria turned to me, eyes wide. Her breathing quickened and she started gasping for air. I grabbed her hand and we left the campfire. We easily fell into the pattern that had become our routine. I squeeze her hand, I breathe. She breathes, and squeezes back. Our pace slowed on the walk back to the nurse's office as I told her stories of tree houses and ice cream." "Adolescence is a time of meandering, metamorphoses, and in some cases misdemeanors. Teenagers as a species are expected to develop into full-blown adults by the time they graduate high school. . . . The act starts out easy enough, balancing chores and school work, but quickly escalates into establishing a social life, and deciding what your future will be like. On top of that mess, I decide to mentor seven to nine 11-year-olds for a week at a time. One word: stressful. I love it. . . . Outdoor School is a haven where "selfish" teenagers have the opportunity to volunteer. Where the "uncommitted" student devotes their time to take care of and teach science to 6th graders." "From Outdoor School I truly learned to have compassion for others as well as the importance of listening, the importance of finding out what people's needs are, and the importance of gaining people's trust. I did not realize it during the times I volunteered at Camp Howard, but what I was learning was changing how I saw others in the world, especially how we all can benefit from each other." "At Outdoor School, with my boots in the mud and my hands buried in the soil alongside students, I transform into the best version of myself. I am not normally outgoing, yet I find myself standing up to lead songs with a moment's notice and stepping in to help less experienced SLs if they feel over their heads. Outdoor School has given me the confidence to apply those leadership skills in areas of my life like youth group, girl scouts, and home life. It's given me a way of dealing with people and meeting them where they are at." "The philosophy I have learned that has influenced my the most is that there are no "bad kids." In Outdoor School, I have learned to recognize that each student leader, staff member, and student has specific needs—from having trouble communicating effectively to needing physical attention to being particular about silverware—and I have been able to address my own particularities and create stronger relationships with the people around me as a result." ​"I had no plans, and as a junior with 10 credits left, I felt I had no future beyond high school. I wasn't even fully decided on whether or not I wanted to bother trying to earn my diploma; all I knew was that if I was dropping out, it would be on my own terms. If nothing else (and there was a lot else), my fantastic experience at Outdoor School gave me the boost I needed to keep trying new things and pushing my boundaries. If I could try something so physically, emotionally, and mentally taxing, something so alien, and do well enough at it that people asked me to come back and do it again, well, I must be able to do more than I thought. Maybe there was a whole world of opportunities out there, and I just wasn't undertaking them because I didn't think I was good enough." Outdoor School returns to the Namanu site! KATU: Kara Mack takes us out to Outdoor School to celebrate Living Rootopia.